Does taking my child to McDonald’s make me a bad Mum? The answer to that question is no. I had this very thought as I sat in McDonald’s yesterday afternoon in Greenwich, and then whilst walking home when my daughter was eating her left over chips in the buggy. So why do I feel guilty, why do I feel guilty that we ate bad food for dinner. 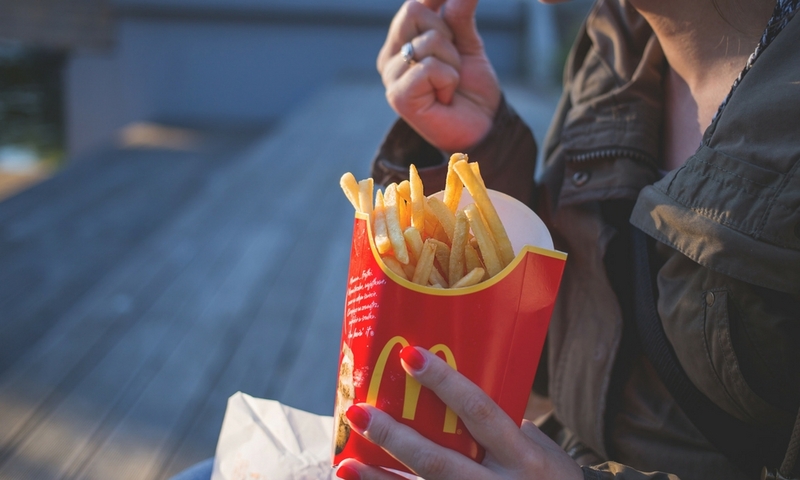 Does taking my daughter to McDonald’s for dinner make me a bad Mum? No it doesn’t, it has it’s advantages, let me tell you. For a start it’s convenient. Yesterday we needed to have an early dinner away from the house, and instead of going for a restaurant sit down meal cue mega meltdown, I thought that McDonald’s would be perfect. We would be in and out, and I would be completely in control. If we needed to escape because of an overtired toddler tantrum we would be able to do that. In the end we did just that, and it worked perfectly. If we have been sitting down waiting for our food, it would have been a very unhappy ending. Happy Meals have a lot to answer for, especially for young children, as they come with a toy. This managed to keep our daughter distracted whilst she ate her dinner, and probably made her eat her dinner as it didn’t feel forced, plus I think it held back the tantrum a little longer. So well done McDonald’s you’re doing something right with these. Safe to say our daughter really likes McDonald’s, and sometimes you just need to feed your child what you know they will eat. For those of you who have been following my blog will know that it’s been increasingly hard to get my daughter to eat, and so I’m happy if she’s eating four chicken nuggets and a small bag of chips. Which she did, so I feel happy that she at least ate her dinner last night. I’m not saying that McDonald’s is an everyday meal for your child at all. We see it very much as a treat, and I explained to our daughter that today’s dinner is a treat, and that tomorrow she’ll be back to the usual pasta and sauce at home. I’m completely aware that a Happy Meal has over 400 calories in it, versus 150 calories in a child’s size pasta and sauce. Yet I would rather she had the 400 calories rather than eat nothing. Like I said it’s a treat and only happens every now again. So, I’m not going to justify my trip to McDonald’s yesterday for tea, there was nothing wrong with it. It was a treat, and it was needed at the time, which is what it’s there for. I bet all the teens or hungover students, don’t have the guilty feeling of going to McDonald’s for tea. I don’t think you have to justify your trip to McDonalds….Your girl was fed and it was convenient! McDonalds is not as unhealthy as they used to be….Yeah, they’re not the best meal in the world but it’s a treat. I think it can be a better choice than many other places we go for a treat and it has amazing coffee. Sonetimes you need Maccy D.
I’m completely the same! It has to be done sometimes simply for the convenience and the fact the whole family enjoys it. Monopoly has just launched so I’m sure we will be making a couple of trips in the forthcoming month!